For other uses, see Rus. The Rus' people (Old East Slavic: Рѹсь; Modern Russian, Ukrainian, Belarusian: Русь (Rus'); Old Norse: Garðar; Greek: Ῥῶς (Rhos)) are generally understood in English-language scholarship as ethnically or ancestrally Scandinavian people trading and raiding on the river-routes between the Baltic and the Black Seas from around the eighth to eleventh centuries CE. Thus they are often referred to in English-language research as "Viking Rus'". The scholarly consensus  is that Rus' people originated in what is currently coastal Middle Sweden around the eighth century and that their name has the same origin as Roslagen in Sweden (with the older name being Roden). Basing themselves among Slavic and Finnic peoples in the upper Volga region, they formed a diaspora of traders and raiders exchanging furs and slaves for silk, silver and other commodities available to the east and south. Around the ninth century, on the river routes to the Black Sea, they had an unclear but significant role in forming the principality of Kievan Rus, gradually assimilating with local Slavic populations. They also extended their operations much further east and south, among the Turkic Bulgars and Khazars, on the routes to the Caspian Sea. By around the eleventh century, the word Rus' was increasingly associated with the principality of Kiev, and the term Varangian was becoming more common as a term for Scandinavians traveling the river-routes. Little, however, is certain about them. This is to a significant extent because, although Rus' people were active over a long period and vast distances, textual evidence for their activities is very sparse and almost never produced by contemporary Rus' people themselves. It's believed that writing was brought to the Rus by the Slavs solely for religious reasons, which arrived to the area much later than they did. The word Rus' in the primary sources does not always mean the same thing as it does when used by today's scholars. Meanwhile, archaeological evidence and researchers' understanding of it is accumulating only gradually. As a trading diaspora, Rus' people intermingled extensively with Finnic, Slavic, and Turkic peoples and their customs and identity seem correspondingly to have varied considerably over time and space. The other key reason for dispute about the origins of Rus' people is the likelihood that they had a role in ninth- to tenth-century state formation in eastern Europe (ultimately giving their name to Russia and Belarus), making them relevant to what are today seen as the national histories of Russia, Ukraine, Sweden, Poland, Belarus, Finland and Baltic states. This has engendered fierce debate as different political interest groups promote their own stories as to who the Rus' originally were, in the belief that the politics of the ancient past legitimize policies in the present. Europe in the 9th century. Roslagen is located along the coast of the northern tip of the pink area marked "Swedes and Goths". The etymology and semantic history of the word Rus' has been a highly contentious topic, on which debate is ongoing. This is partly because of a widespread assumption that by identifying the linguistic origin of the name Rus', scholars can identify the origins of the people whom it described. This assumption has, however, been criticized in twenty-first-century scholarship. According to the prevalent theory, the name Rus', like the Finnish name for Sweden (Ruotsi), is derived from an Old Norse term for "the men who row" (rods-) as rowing was the main method of navigating the rivers of Eastern Europe, and that it could be linked to the Swedish coastal area of Roslagen (Rus-law) or Roden, as it was known in earlier times. The name Rus' would then have the same origin as the Finnish and Estonian names for Sweden: Ruotsi and Rootsi. The earliest Slavonic-language narrative account of Rus' history is the Primary Chronicle, compiled and adapted from a wide range of sources in Kiev at the start of the thirteenth century. It has therefore been influential on modern history-writing, but it is also much later than the time it describes, and historians agree it primarily reflects the political and religious politics of the time of Mstislav I of Kiev. However, the chronicle does include the texts of a series of Rus'–Byzantine Treaties from 911, 945, and 971. The Rus'–Byzantine Treaties give a valuable insight into the names of the Rus'. Of the fourteen Rus' signatories to the Rus'–Byzantine Treaty in 907, all had Norse names. By the Rus'–Byzantine Treaty (945) in 945, some signatories of the Rus' had Slavic names while the vast majority had Norse names. The Chronicle presents the following origin myth for the arrival of Rus' in the region of Novgorod: the Rus' were a group of Varangians 'who imposed tribute upon the Chuds, the Slavs, the Merians, the Ves', and the Krivichians' (a variety of Slavic and Finnic peoples). The tributaries of the Varangians drove them back beyond the sea and, refusing them further tribute, set out to govern themselves. There was no law among them, but tribe rose against tribe. Discord thus ensued among them, and they began to war one against the other. They said to themselves, "Let us seek a prince who may rule over us, and judge us according to the Law". They accordingly went overseas to the Varangian Russes: these particular Varangians were known as Russes, just as some are called Swedes, and others Normans, English, and Gotlanders, for they were thus named. The Chuds, the Slavs, the Krivichians and the Ves' then said to the people of Rus', "Our land is great and rich, but there is no order in it. Come to rule and reign over us". Thus they selected three brothers, with their kinsfolk, who took with them all the Russes and migrated. The oldest, Rurik, located himself in Novgorod; the second, Sineus, at Beloozero; and the third, Truvor, in Izborsk. On account of these Varangians, the district of Novgorod became known as the land of Rus'. Later, the Primary Chronicle claims, they conquered Kiev and created the state of Kievan Rus' (which, most historians agree, was preceded by the Rus' Khaganate). Ship burial of a Rus chieftain as described by the Arab traveler Ahmad ibn Fadlan who visited north-eastern Europe in the 10th century. Arabic-language sources for Rus' people are relatively numerous, with over 30 relevant passages in roughly contemporaneous sources. It can be difficult to be sure that when Arabic sources talk about Rus' they mean the same thing as modern scholars. Sometimes it seems to be a general term for Scandinavians: when Al-Yaqūbi recorded Rūs attacking Seville in 844, he was almost certainly talking about vikings based in Frankia. At other times, it might denote people other than or alongside Scandinavians: thus the Mujmal al-Tawarikh calls Khazars and Rus' "brothers"; later, Muhammad al-Idrisi, Al-Qazwini, and Ibn Khaldun all identified the Rus' as a sub-group of the Turks. These uncertainties have fed into debates about the origins of the Rus'. Arabic sources for the Rus' had been collected, edited and translated for Western scholars by the mid-twentieth century. However, relatively little use was made of the Arabic sources in studies of the Rus' before the twenty-first century. This is partly because they mostly concern the region between the Black and the Caspian Seas, and from there north along the lower Volga and the Don. This made them less relevant than the Primary Chronicle to understanding European state formation further west. Moreover, imperialist ideologies in Russia and more widely discouraged research emphasising an ancient or distinctive history for Inner Eurasian peoples. Arabic sources portray Rus' people fairly clearly as a raiding and trading diaspora, or as mercenaries, under the Volga Bulghars or the Khazars, rather than taking a role in state formation. I have seen the Rus as they came on their merchant journeys and encamped by the Itil. I have never seen more perfect physical specimens, tall as date palms, blond and ruddy; they wear neither tunics nor caftans, but the men wear a garment which covers one side of the body and leaves a hand free. Each man has an axe, a sword, and a knife, and keeps each by him at all times. The swords are broad and grooved, of Frankish sort. Each woman wears on either breast a box of iron, silver, copper, or gold; the value of the box indicates the wealth of the husband. Each box has a ring from which depends a knife. The women wear neck-rings of gold and silver. Their most prized ornaments are green glass beads. They string them as necklaces for their women. Apart from Ibn Fadlan's account, Normanist theory draws heavily on the evidence of the Persian traveler Ibn Rustah who, it is postulated, visited Novgorod (or Tmutarakan, according to George Vernadsky) and described how the Rus' exploited the Slavs. As for the Rus, they live on an island ... that takes three days to walk round and is covered with thick undergrowth and forests; it is most unhealthy. ... They harry the Slavs, using ships to reach them; they carry them off as slaves and…sell them. They have no fields but simply live on what they get from the Slav's lands. ... When a son is born, the father will go up to the newborn baby, sword in hand; throwing it down, he says, "I shall not leave you with any property: You have only what you can provide with this weapon." When the Varangians first appeared in Constantinople (the Paphlagonian expedition of the Rus' in the 820s and the Siege of Constantinople in 860), the Byzantines seem to have perceived the Rhos (Greek: Ῥώς) as a different people from the Slavs. At least no source says they are part of the Slavic race. Characteristically, pseudo-Symeon Magister and Theophanes Continuatus refer to the Rhos as Δρομῖται (dromitai), a word related to the Greek word meaning a run, suggesting the mobility of their movement by waterways. Ἐσσονπῆ Essoupi "does not sleep" nes uppi "upper promontory"
Οὐλβορσί Oulvorsi "island of the waterfall" Úlfarsey "Úlfar's island"
Γελανδρί Gelandri "the sound of the fall" gjallandi/gellandi "yelling, loudly ringing"
Ἀειφόρ Aeifor pelicans' nesting place æ-fari/ey-færr "never passable"
Βαρονφόρος Varouforos it forms a great maelstrom vara-foss "stony shore rapid"
Λεάντι Leanti "surge of water" hlæjandi "laughing"
Στρούκουν Stroukoun "the little fall" strjúkandi "stroking, delicately touching"
The first Western European source to mention the Rus' are the Annals of St. Bertin. These relate that Emperor Louis the Pious' court at Ingelheim, in 839, was visited by a delegation from the Byzantine emperor. In this delegation there were two men who called themselves Rhos (Rhos vocari dicebant). Louis enquired about their origins and learnt that they were Swedes (suoni). Fearing that they were spies for their allies, the Danes, he incarcerated them, before letting them proceed after receiving reassurances from Byzantium. 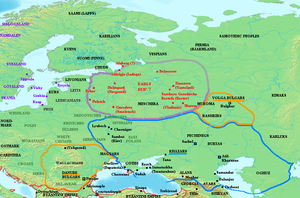 Subsequently, in the 10th and 11th centuries, Latin sources routinely confused the Rus' with the extinct East Germanic tribe of Rugians. Olga of Kiev, for instance, was designated in one manuscript as a Rugian queen. The quantity of archaeological evidence for the regions where Rus people were active grew steadily through the twentieth century, and beyond, and the end of the Cold War made the full range of material increasingly accessible to researchers. Key excavations have included those at Staraja Ladoga, Novgorod, Rurikovo Gorodischche, Gnëzdovo, Chernigov, Shestovitsa, numerous settlements between the Upper Volga and the Oka rivers, and Kiev. Twenty-first century research, therefore, is giving the synthesis of archaeological evidence an increasingly prominent place in understanding the Rus'. The distribution of coinage, including the early ninth-century Peterhof Hoard, has provided important ways to trace the flow and quantity of trade in areas where Rus were active, and even, through graffiti on the coins, the languages spoken by traders. Map showing Varangian settlement (in red) and location of Slavic tribes (in grey), mid-9th century Khazar influence indicated with blue outline. Having settled Aldeigja (Ladoga) in the 750s, Scandinavian colonists played an important role in the early ethnogenesis of the Rus' people and in the formation of the Rus' Khaganate. The Varangians (Varyags, in Old East Slavic) are first mentioned by the Primary Chronicle as having exacted tribute from the Slavic and Finnic tribes in 859. It was the time of rapid expansion of the Vikings in Northern Europe; England began to pay Danegeld in 859, and the Curonians of Grobin faced an invasion by the Swedes at about the same date. It has been argued that the word Varangian, in its many forms, does not appear in primary sources until the eleventh century (though it does appear frequently in later sources describing earlier periods). This suggests that the term Rus' was used broadly to denote Scandinavians until it became too firmly associated with the now extensively Slavicised elite of Kievan Rus. At that point, the new term Varangian was increasingly preferred to name Scandinavians, probably mostly from what is currently Sweden, plying the river-routes between the Baltic and the Black/Caspian Seas. 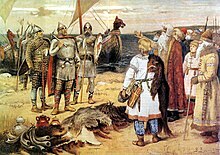 Due largely to geographic considerations, it is often argued that most of the Varangians who traveled and settled in the lands of eastern Baltic, modern Russian Federation and lands to the south came from the area of modern Sweden. The Varangians left a number of rune stones in their native Sweden that tell of their journeys to what is today Russia, Ukraine, Greece, and Belarus. Most of these rune stones can be seen today, and are a telling piece of historical evidence. The Varangian runestones tell of many notable Varangian expeditions, and even account for the fates of individual warriors and travelers. In Russian history, two cities are used to describe the beginnings of the country: Kiev and Novgorod. In the first part of the eleventh century the former was already a Slav metropolis, rich and powerful, a fast growing centre of civilization adopted from Byzantium. The latter town, Novgorod, was another centre of the same culture but founded in different surroundings, where some old local traditions moulded this commercial city into a mighty oligarchic republic of a kind otherwise unknown in this part of Europe. These towns have tended to overshadow other places of a significance that they had acquired long before Kiev and Novgorod. The two original centers of Rus were Staraja Ladoga and Rurikovo Gorodishche, two points on the ends the Volkhov, a river running for 200 km between Lake Ilmen in the south to Lake Ladoga in the north. This was the territory that most probably was originally called by the Norsemen Gardar, a name that long after Viking Age was given much wider content and become Gardariki, denomination for whole Old Russian State. The area between the lakes was the original Rus, and it was from here its name was transferred to the Slav territories on the middle Dnieper, which eventually became “Ruskaja zemlja”. The pre-history of the first territory of Rus has been sought in the developments around the mid eighth century, when Staraja Ladoga was founded as a trading place, serving the operations of Scandinavian hunters and dealers in furs obtained in the north-eastern forest zone of Eastern Europe. In the early period (the second part of the eighth and first part of the ninth century) Norse presence is only visible at Staraja Ladoga, and to a much lesser degree at a few other sites in the northern parts of Eastern Europe. The objects that represent Norse material culture of this period are rare outside Ladoga and mostly known as single finds. This rarity continues through the ninth century until the whole situation changes radically during the next century, when historians meet, at many places and in relatively large quantities, the material remains of a thriving Scandinavian culture. For a short period of time, some areas of Eastern Europe became as much part of the Norse world as were Danish and Norwegian territories in the West. 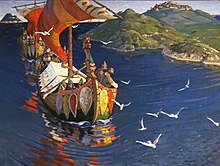 The culture of the Rus contained Norse elements used as a manifestation of their Scandinavian background. These elements, which were current in tenth century Scandinavia, appear at various places in form of collections of many types of metal ornaments, mainly female but even male, such as weapons, decorated parts of horse bridle, and diverse objects embellished in current Norse art styles. The historiography of the origins of the Rus' is infamously contentious, due to its perceived importance for the legitimation of nation-building, imperialism, and independence movements within the Slavonic-speaking world, and for legitimating different political relationships between eastern and western European countries. The Rus' is particularly important in the historiography and cultural context to Russia, Belarus and Ukraine but have also featured prominently for Poland. The Rus' is featured prominently in the history of Baltic states, Scandinavia, Poland, Byzantium Empire . Added to these ideological forces is a scarcity of contemporary evidence for the emergence of a Rus' polity, and the great ethnic diversity and complexity of the wide area where Rus' people were active. Notwithstanding the existence of a diverse range of historical debates, contention has crystallized around whether the development of Kievan Rus' was influenced by non-Slavic, Viking migrants (this idea is characterized as the 'Normanist theory'), or whether Rus' emerged from autochthonous Slavic political development (known as the 'anti-Normanist theory'). That Scandinavians migrated to the Ancient East-Slavic area. That Kiev’s ruling dynasty was established by Scandinavians. That the name Rus’ is etymologically Old Norse. That Scandinavian migrants influenced the development of the East-Slavic state. That Scandinavian migrants created the first East-Slavic state. That the Scandinavians succeeded because of their racial superiority. That the past shapes current politics: specifically, that descendants of Scandinavians are natural rulers, whereas Slavs are natural subordinates. Second World War Norwegian Nazi propaganda poster encouraging Norwegians to fight alongside the German Waffen-SS against the USSR, portraying the fight as re-enacting Viking activity. The Normanist theory gained prominence in Russia (albeit not under that name) through the German historian Gerhardt Friedrich Müller (1705–1783), who was invited to work in the Russian Academy of Sciences in 1725. Müller built on arguments made by his predecessor Gottlieb-Siegfried Bayer in the papers De Varagis ('on the Varangians', 1729) and Origines russicae ('Russian origins', 1736), and on the Russian Primary Chronicle, written in the twelfth century, and covering the years 852 to 1110. At the beginning of an important speech in 1749, later published as Origines gentis et nominis Russorum ('The Origins of the People and the Name of the Russians'), Müller argued that Russia owed its name and early ruling dynasty to ethnically Scandinavian Varangians. This statement caused anger in his Russian audience, and earned him much animosity during his professional career in Russia. Scathing criticism from Lomonosov, Krasheninnikov, and other Russian historians led to Müller being forced to suspend his work on the issue until Lomonosov's death. It was even thought during the twentieth century that much of his research was destroyed, but recent research suggests that this is not the case: Müller managed to rework it and had it reprinted as Origines Rossicae in 1768. Despite the negative reception in the mid-eighteenth century, by the end of the century, Müller's views were the consensus in Russian historiography, and this remained largely the case through the nineteenth century and early twentieth centuries. Russian historians who accepted this historical account included Nikolai Karamzin (1766–1826) and his disciple Mikhail Pogodin (1800–75), who gave credit to the claims of the Primary Chronicle that the Varangians were invited by East Slavs to rule over them and bring order. The theory was not without political implications. For some, it fitted with embracing and celebrating the multiethnic character of the Russian Empire. However, it was also consistent with the racial theory widespread at the time that Normans (and their descendants) were naturally suited to government, whereas Slavs were not. According to Karamzin the Norse migration formed the basis and justification for Russian autocracy (as opposed to anarchy of the pre-Rurikid period), and Pogodin used the theory to advance his view that Russia was immune to social upheavals and revolutions, because the Russian state originated from a voluntary treaty between the people of Novgorod and Varangian rulers. Notwithstanding other suggestions, the name Rus' can readily be interpreted as originating in Old Norse. The list of cataracts on the Dnieper listed by Constantine VII in his De Administrando Imperio as belonging to the language of the Rhos can most readily be etymologised as Old Norse. The Annals of St. Bertin account of the Rhos for 839 has them identify themselves as suoni (Swedes). Thirteenth-century Icelandic historiography portrays close connections between the eleventh-century rulers of Rus' and Scandinavian dynasties in England and Norway. In the twenty-first century, analyses of the rapidly growing range of archaeological evidence further noted that high-status ninth- to tenth-century burials of both men and women in the vicinity of the Upper Volga exhibit material culture largely consistent with that of Scandinavia (though this is less the case away from the river, or further downstream). This has been seen as further demonstrating the Scandinavian character of elites in "Old Rus'". It is also agreed, however, that ancestrally Scandinavian Rus' aristocrats, like Normans elsewhere, swiftly assimilated culturally to a Slavic identity: in the words of F. Donald Logan, "in 839, the Rus were Swedes; in 1043 the Rus were Slavs". This near absence of cultural traces (aside from several names, and perhaps the veche-system of Novgorod, comparable to thing in Scandinavia), is noteworthy, and the processes of cultural assimilation in Rus' are an important area of research. There is uncertainty as to how small the Scandinavian migration to Rus' was, but some recent archaeological work has argued for a substantial number of 'free peasants' settling in the upper Volga region. It is important to note that a number of Anglophone scholars remain equivocal about whether the question of Rus' origins can really be solved, however, either because the evidence is not good enough or because the Rus' were never an ethnic group with a clear point of origin. In the earlier twentieth century, Nazi Germany promoted the idea that Russia owed its statehood to a Germanic, racially superior, elite. During the Second World War, the German government promised the Fascist Quisling government of Norway territory on the historic Austrvegr, reflecting Quisling's ambition to reenact his Normanist view of Viking history. For the organization of a Russian State structure was not the result of Russian Slavdom's State-political capacity, but rather a wonderful example of the State-building activity of the German element in an inferior race. The Slav is never able to build anything himself. In the long run, he's not capable of it. I'll come back to this later. With the exception of a few phenomena produced by Asia every couple of centuries, through that mixture of two heredities which may be fortunate for Asia but is unfortunate for us Europeans — with the exception, therefore, of an Attilla, a Ghenghis Khan, a Tamerlaine, a Lenin, a Stalin — the mixed race of the Slavs is based on a sub-race with a few drops of blood of our blood, blood of a leading race; the Slav is unable to control himself and create order. He is able to argue, able to debate, able to disintegrate, able to offer resistance against every authority and to revolt. But these human shoddy goods are just as incapable of maintaining order today as they were 700 or 800 years ago, when they called in the Varangians, when they called in the Ruriks. Golden rouble depicting Rurik, issued to mark the 1150th anniversary of the birth of the Russian state. A Scandinavian origin of the Rus' has been bitterly contested by Slavic nationalists. Starting with Lomonosov (1711–1765), East Slavic scholars have criticized the idea of Norse invaders. By the early 20th century, the traditional anti-Normanist doctrine (as articulated by Dmitry Ilovaisky) seemed to have lost currency, but in Stalinist Russia, the anti-Normanist arguments were revived and adopted in official Soviet historiography, partly in response to Nazi propaganda, which posited that Russia owed its existence to a Germanic ruling elite. Mikhail Artamonov ranks among those who attempted to reconcile both theories by hypothesizing that the Kievan state united the southern Rus' (of Slavic stock) and the northern Rus' (of Germanic stock) into a single nation. In light of evidence, theories - most of them proposed by Soviet scholars with nationalistic agendas - of a Slav state in the Baltic region attacked by and ultimately absorbing Viking invaders are more likely the product of wishful thinking than of fact. The staunchest advocate of the anti-Normanist views in the period following the Second World War was Boris Rybakov, who argued that the cultural level of the Varangians could not have warranted an invitation from the culturally advanced Slavs. This conclusion leads Slavicists to deny the Primary Chronicle, which writes that the Varangian Rus' were invited by the native Slavs. Rybakov assumed that Nestor, putative author of the Chronicle, was biased against the pro-Greek party of Vladimir Monomakh and supported the pro-Scandinavian party of the ruling prince Svyatopolk. He cites Nestor as a pro-Scandinavian manipulator and compares his account of Rurik's invitation with numerous similar stories found in folklore around the world. By the twenty-first century, most professional scholars, in both Anglophone and Slavonic-language scholarship, had reached a consensus that the origins of the Rus' people lay in Scandinavia and that this originally Scandinavian elite had a significant role in forming the polity of Kievan Rus'. Indeed, in 1995, the Russian archaeologist Leo Klejn "gave a paper entitled ‘The End of the Discussion’, in the belief that anti-Normanism ‘was dead and buried’". However, Klejn soon had to revise this opinion as anti-Normanist ideas gained a new prominence in both public and academic discourse in Russia, Ukraine, and Belarus. Anglophone scholarship has identified the continued commitment to anti-Normanism in these countries since the collapse of the Soviet Union as being motivated by present-day ethno-nationalism and state-formation. One prominent Russian example occurred with an anti-Normanist conference in 2002, which was followed by publications on the same theme, and which appears to have been promoted by Russian government policy of the time. Accordingly, anti-Normanist accounts are prominent in some twenty-first century Russian school textbooks. Meanwhile, in Ukraine and to a lesser extent Belarus, post-Soviet nation-building opposed to a history of Russian imperialism has promoted anti-Normanist views in academia and, to a greater extent, popular culture. Obverse of a Ukrainian 1 hryvnia note, first issued in 2006, depicting Volodymyr the Great (c. 958–1015), Prince of Novgorod and Grand Prince of Kiev, who claimed descent from the Rus' Rurik. Three early emperors of the Urartian Empire at Caucasus from 8th to 6th century BC had their names Russa I, Russa II and Russa III, documented in cuneiform monuments. The medieval legend of three brothers, one named Rus, had also its predecessor in very similar legend from ancient Armenians with almost the same classical name (studies by D.J. Marr). Furthermore, Kiev was founded centuries before the Rus' rule. The ancient Sarmatian tribe of the Roxolani (from the Ossetic, ruhs 'light'; R русые волосы /rusyje volosy/ "light-brown hair"; cf. Dahl's dictionary definition of Русь /rus/: Русь ж. в знач. мир, белсвет. Rus, fig. world, universe [белсвет: lit. "white world", "white light"]). From the Old Slavic name that meant "river-people" (tribes of fishermen and ploughmen who settled near the rivers Dnieper, Don, Dniester and Western Dvina and were known to navigate them). The rus root is preserved in the modern Slavic and Russian words "ruslo" (river-bed), "rusalka" (water sprite), etc. From one of two rivers in Ukraine (near Kiev and Pereyaslav), Ros and Rusna, whose names are derived from a postulated Slavic term for water, akin to rosa (dew) (related to the above theory). A Slavic word rusy (refers only to hair color — from dark ash-blond to light-brown), cognate with ryzhy (red-haired) and English red. A postulated proto-Slavic word for bear, cognate with Greek arctos and Latin ursus. The controversies over the nature of the Rus and the origins of the Russian state have bedevilled Viking studies, and indeed Russian history, for well over a century. It is historically certain that the Rus were Swedes. The evidence is incontrovertible, and that a debate still lingers at some levels of historical writing is clear evidence of the holding power of received notions. The debate over this issue - futile, embittered, tendentious, doctrinaire - served to obscure the most serious and genuine historical problem which remains: the assimilation of these Viking Rus into the Slavic people among whom they lived. The principal historical question is not whether the Rus were Scandinavians or Slavs, but, rather, how quickly these Scandinavian Rus became absorbed into Slavic life and culture. Scholars such as Omeljan Pritsak and Horace G. Lunt offer explanations that go beyond simplistic attempts to attribute 'ethnicity' on prima facie interpretation of literary, philological, and archaeological evidence. They view the Rus' as disparate, and often mutually antagonistic, clans of charismatic warriors and traders who formed wide-ranging networks across the North and Baltic Seas. They were a "multi-ethnic, multilingual and non-territorial community of sea nomads and trading settlements" that contained numerous Norsemen—but equally Slavs, Balts, and Finns. Evidence provided by the Primary Chronicle, written some three centuries later, cannot be taken as an accurate ethnographic account; as tales of 'migration' from distant lands were common literary topoi used by rulers to legitimise their contemporary rule whilst at the same time differentiating themselves from their "Baltic" and "Slavic" subject tribes. Tolochko argues "the story of the royal clan's journey is a device with its own function within the narrative of the chronicle. ... Yet if we take it for what it actually is, if we accept that it is not a documentary ethnographic description of the 10th century, but a medieval origo gentis[a] masterfully constructed by a Christian cleric of the early 12th century, then we have to reconsider the established scholarly narrative of the earliest phase of East European history, which owes so much to the Primary Chronicle. Archaeological research, synthesizing a wide range of twentieth-century excavations, has begun to develop what Jonathan Shepard has called a 'bottom up' vision of the formation of the Rus' polity, in which, during the ninth and tenth century increasingly intensive trade networks criss-crossed linguistically and ethnically diverse groups around rivers like the Volga, the Don, the Dnieper. This may have produced 'an essentially voluntary convergence of groupings in common pursuit of primary produce exchangeable for artifacts from afar'. This fits well with the image of Rus' that dominates the Arabic sources, focusing further south and east, around the Black and Caspian Seas, the Caucasus and the Volga Bulghars. Yet this narrative, though plausible, contends with the 'top-down' image of state development implied by the Primary Chronicle, archaeological assemblages indicating Scandinavian-style weapon-bearing elites on the Upper Volga, and evidence for slave-trading and violent destruction of fortified settlements. Numerous artefacts of Scandinavian affinity have been found in northern Russia. However, exchange between the north and southern shores of the Baltic had occurred since the Iron Age (albeit limited to immediately coastal areas). Northern Russia and adjacent Finnic lands had become a profitable meeting ground for peoples of diverse origins, especially for the trade of furs, and attracted by the presence of oriental silver from the mid-8th century AD. There is an undeniable presence of goods and people of Scandinavian origin; however, the predominant people remained the local (Baltic and Finnic) peoples. The increasing volume of trade and internal competition necessitated higher forms of organization. The Rus' appeared to emulate aspects of Khazar political organization—hence the mention of a Rus' chaganus in the Carolingian court in 839 (Royal Frankish Annals). Legitimization was sought by way of adopting a Christian and linguistically Slavic high culture that became the Kieven Rus'. The burials ('chamber' or 'retainer' graves) attributed to the Kievan Rus' have only a superficial resemblance to supposed Scandinavian prototypes—only the grave construction was similar, whilst the range of accompanying artefacts, the inclusion of weapons, horses and slave girls have no parallels in Scandinavia. Moreover, there is doubt if the emerging Kievan Rus' were the same clan as the "Rus" who visited the Carolingians in 839 or who attacked Constantinople in 860 AD. The rise of Kiev itself is mysterious. 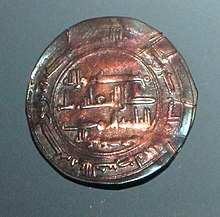 Devoid of any silver dirrham finds in the 8th century AD, it was situated west of the profitable fur and silver trade networks that spanned from the Baltic to the Muslim lands, via the Volga-Kama basins. At the prime hill in Kiev, fortifications and other symbols of consolidation and power appear from the 9th century, thus preceding the literary appearance of 'Rus' in the middle Dnieper region. By the 10th century, the lowlands around Kiev had extensive 'Slavic' styled settlements, and there is evidence of growing trade with the Byzantine lands. This might have attracted Rus' movements, and a shift in power, from the north to Kiev. Thus, Kiev does not appear to have evolved from the infrastructure of the Scandinavian trade networks, but rather it forcibly took them over, as evidenced by the destruction of numerous earlier trade settlements in the north, including the famous Staraja Ladoga. ^ James E. Montgomery, ‘Vikings and Rus in Arabic Sources’, in Living Islamic History, ed. by Yasir Suleiman (Edinburgh: Edinburgh University Press, 2010), pp. 151–65 (pp. 152-54). ^ Marika Mägi, In Austrvegr: The Role of the Eastern Baltic in Viking Age Communication Across the Baltic Sea, The Northern World, 84 (Leiden: Brill, 2018), pp. 141-216 (esp. p. 216). ^ Blöndal, Sigfús (1978). The Varangians of Byzantium. Cambridge University Press. p. 1. ISBN 9780521035521. Retrieved 2 February 2014. ^ Stefan Brink, 'Who were the Vikings? ', in The Viking World, ed. by Stefan Brink and Neil Price (Abingdon: Routledge, 2008), pp. 4-10 (pp. 6-7). ^ a b "Russ, adj. and n." OED Online, Oxford University Press, June 2018, www.oed.com/view/Entry/169069. Accessed 25 July 2018. ^ Thorir Jonsson Hraundal, 'New Perspectives on Eastern Vikings/Rus in Arabic Sources', Viking and Medieval Scandinavia, 10 (2014), 65–97 doi:10.1484/J.VMS.5.1052 (pp. 66-67). ^ The Russian Primary Chronicle: Laurentian Text, ed. and trans. by Samuel Hazzard Cross and Olgerd P. Sherbowitz-Wetzor (Cambridge, MA: The Medieval Academy of America, 1953), ISBN 0-910956-34-0, s.aa. 6368-6370 (860-862 CE) [pp. 59-60. ^ Thorir Jonsson Hraundal, 'New Perspectives on Eastern Vikings/Rus in Arabic Sources', Viking and Medieval Scandinavia, 10 (2014), 65–97 doi:10.1484/J.VMS.5.1052, p. 68. ^ P.B. Golden, “Rūs”, in Encyclopaedia of Islam, Second Edition, Edited by: P. Bearman, Th. Bianquis, C.E. Bosworth, E. van Donzel, W.P. Heinrichs. Consulted online on 26 July 2018 doi:10.1163/1573-3912_islam_COM_0942. ^ James E. Montgomery, 'Ibn Faḍlān and the Rūsiyyah', Journal of Arabic and Islamic Studies, 3 (2000), 1-25. ^ Ann Christys, Vikings in the South (London: Bloomsbury, 2015), pp. 15-45 (esp. p. 31). ^ Thorir Jonsson Hraundal, 'New Perspectives on Eastern Vikings/Rus in Arabic Sources', Viking and Medieval Scandinavia, 10 (2014), 65–97 doi:10.1484/J.VMS.5.1052 (p. 73). ^ A. Seippel (ed. ), Rerum normannicarum fonts arabici, 2 vols (Oslo: Brøgger, 1896). This edition of Arabic sources for vikings was translated into Norwegian, and expanded, by H. Birkeland (ed. and trans. ), Nordens historie: Middlealderen etter arabiske kilder (Oslo: Dyburad, 1954). It was translated into English by Alauddin I. Samarra’i (trans. ), Arabic Sources on the Norse: English Translation and Notes Based on the Texts Edited by A. Seippel in ‘Rerum Normannicarum fontes Arabici’ (unpublished doctoral thesis, University of Wisconsin–Madison, 1959). ^ James E. Montgomery, ‘Ibn Rusta’s Lack of “Eloquence”, the Rus, and Samanid Cosmography’, Edebiyat, 12 (2001), 73–93. ^ James E. Montgomery, ‘Arabic Sources on the Vikings’, in The Viking World, ed. by Stefan Brink (London: Routledge, 2008), pp. 550–61. ^ James E. Montgomery, ‘Vikings and Rus in Arabic Sources’, in Living Islamic History, ed. by Yasir Suleiman (Edinburgh: Edinburgh University Press, 2010), pp. 151–65. ^ Thorir Jonsson Hraundal, 'New Perspectives on Eastern Vikings/Rus in Arabic Sources', Viking and Medieval Scandinavia, 10 (2014), 65–97 doi:10.1484/J.VMS.5.1052. ^ Thorir Jonsson Hraundal, 'New Perspectives on Eastern Vikings/Rus in Arabic Sources', Viking and Medieval Scandinavia, 10 (2014), 65–97 doi:10.1484/J.VMS.5.1052 (pp. 70-78). ^ Jones, Gwyn (2001). A History of the Vikings. Oxford University Press. p. 164. ISBN 0-19-280134-1. ^ Quoted from National Geographic, March 1985; Compare: Ferguson, Robert (2009). The Hammer and the Cross: A New History of the Vikings. Penguin UK. ISBN 9780141923871. Retrieved 25 July 2016. They have no fields but simply live on what they get from the Slavs' lands. ^ Volt, Ivo; Janika Päll (2005). Byzantino-Nordica 2004: Papers Presented at the International Symposium of Byzantine Studies Held on 7-11 May 2004 in Tartu, Estonia. Morgenstern Society. p. 16. ISBN 978-9949-11-266-1. Retrieved 28 September 2016. ^ H. R. Ellis Davidson, The Viking Road to Byzantium (London: Allen & Unwin, 1976), p. 83. ^ Sigfús Blöndal, ''The Varangians of Byzantium: An Aspect of Byzantine Military History'', rev. and trans. by Benedikt S. Benedikz (Cambridge: Cambridge University Press, 1978), pp. 9-12. ^ Wladyslaw Duczko, Viking Rus: Studies on the Presence of Scandinavians in Eastern Europe (Leiden: Brill, 2004), pp. 10-59. ^ Jonathan Shepard, 'The Viking Rus and Byzantium', ,in The Viking World, ed. by Stefan Brink and Neil Price (Abingdon: Routledge, 2008), pp. 496-516 (p. 497). ^ Janet Martin, 'The First East Slavic State', in A Companion to Russian History, ed. by Abbott Gleason (Oxford: Blackwell, 2009), pp. 34-50 (p. 36). ^ "The Varangian Guard 988-453". google.no. ^ "The Varangians of Byzantium". google.com. ^ Wladyslaw Duczko, Viking Rus: Studies on the Presence of Scandinavians in Eastern Europe (Leiden: Brill, 2004). ^ Jonathan Shepherd, 'Review Article: Back in Old Rus and the USSR: Archaeology, History and Politics', English Historical Review, vol. 131 (no. 549) (2016), 384-405 doi:10.1093/ehr/cew104. ^ Forte, Angelo; Oram, Richard; Pedersen, Frederik (2005). Viking Empires. Cambridge University Press. pp. 13–14. ISBN 0-521-82992-5. ^ Marika Mägi, In Austrvegr: The Role of the Eastern Baltic in Viking Age Communication Across the Baltic Sea, The Northern World, 84 (Leiden: Brill, 2018), p. 195, citing Alf Thulin, 'The Rus' of Nestor's Chronicle', Mediaeval Scandinavia, 13 (2000), 70-96. ^ Duczko, Wladyslaw. Viking Rus : Studies on the Presence of Scandinavians in Eastern Europe. The Northern World. Leiden: Brill, 2004. ^ "Rus | people". Encyclopedia Britannica. Retrieved 20 February 2019. ^ Roman Zakharii, 'The Historiography of Normanist and Anti-Normanist theories on the origin of Rus’: A review of modern historiography and major sources on Varangian controversy and other Scandinavian concepts of the origins of Rus’' (unpublished M.Phil. thesis, University of Oslo, 2002). ^ Wladyslaw Duczko, Viking Rus: Studies on the Presence of Scandinavians in Eastern Europe (Leiden: Brill, 2004), pp. 3-9. ^ Serhii Plokhy, The Origins of the Slavic Nations Premodern Identities in Russia, Ukraine, and Belarus (Cambridge: Cambridge University Press, 2006), pp. 10-48. ^ Christian Raffensperger, 'The Place of Rus’ in Medieval Europe[permanent dead link]', History Compass, 12/11 (2014), 853–65 doi:10.1111/hic3.12201 (pp. 853-54). ^ Elena Melnikova, 'The "Varangian Problem": Science in the Grip of Ideology and Politics', in Russia's Identity in International Relations: Images, Perceptions, Misperceptions, ed. by Ray Taras (Abingdon: Routledge, 2013), pp. 42-52. ^ "Treaties Between the Rus and the Byzantine – Eastwards to Miklagard". onlineacademiccommunity.uvic.ca. Retrieved 20 February 2019. ^ Janet Martin, 'The First East Slavic State', in A Companion to Russian History, ed. by Abbott Gleason (Oxford: Blackwell, 2009), pp. 34-50 (pp. 34-36). ^ "Normanist, n. and adj." OED Online, Oxford University Press, June 2018, www.oed.com/view/Entry/128286. Accessed 25 July 2018. ^ Dmitry Nikolayevich Verkhoturov, 'Normanism: What's in a Name? ', Valla, 1.5 (2015), 57-65. ^ Wladyslaw Duczko, Viking Rus: Studies on the Presence of Scandinavians in Eastern Europe (Leiden: Brill, 2004), 4. ^ Dmitry Nikolayevich Verkhoturov, 'Normanism: What's in a Name? ', Valla, 1.5 (2015), 57-65 (p. 57). ^ Serhii Plokhy, Lost Kingdom: The Quest for Empire and the Making of the Russian Nation from 1740 to the Present (London: Allen Lane, 2017). ^ Serhii Plokhy, Ukraine and Russia: Representations of the Past (Toronto: University of Toronto Press, 2008), chapter 1. ^ Elena Melnikova, 'The "Varangian Problem": Science in the Grip of Ideology and Politics', in Russia's Identity in International Relations: Images, Perceptions, Misperceptions, ed. by Ray Taras (Abingdon: Routledge, 2013), pp. 42-52 (p. 43). ^ Dmitry Nikolayevich Verkhoturov, 'Normanism: What's in a Name? ', Valla, 1.5 (2015), 57-65 (pp. 58-59). ^ Elena Melnikova, 'The "Varangian Problem": Science in the Grip of Ideology and Politics', in Russia's Identity in International Relations: Images, Perceptions, Misperceptions, ed. by Ray Taras (Abingdon: Routledge, 2013), pp. 42-52 (pp. 44-45). ^ Christian Promitzer, 'Physical anthropology and ethnogenesis in Bulgaria, 1878–1944', Focaal—Journal of Global and Historical Anthropology, 58 (2010), 47–62 doi:10.3167/fcl.2010.580104 (pp. 49-50). ^ Cf. Richard Mcmahon, 'Anthropological Race Psychology 1820–1945: A Common European System of Ethnic Identity Narratives', Nations and Nationalism, 15 (2009), 575–96 (p. 579). ^ Cf. Matthew H. Hammond, 'Ethnicity and the Writing of Medieval Scottish History', The Scottish Historical Review, vol. 85 (no. 219) (April 2006), 1-27, doi:10.1353/shr.2006.0014. ^ Omeljan Pritsak, "Rus'", in Medieval Scandinavia: An Encyclopedia, ed. by Phillip Pulsiano (New York: Garland, 1993), pp. 555-56. ^ Jonathan Shepard, 'The Viking Rus and Byzantium', , in The Viking World, ed. by Stefan Brink and Neil Price (Abingdon: Routledge, 2008), pp. 496-516 (p. 497). ^ a b c Logan 2005, p. 184 "The controversies over the nature of the Rus and the origins of the Russian state have bedevilled Viking studies, and indeed Russian history, for well over a century. It is historically certain that the Rus were Swedes. The evidence is incontrovertible, and that a debate still lingers at some levels of historical writing is clear evidence of the holding power of received notions. The debate over this issue - futile, embittered, tendentious, doctrinaire - served to obscure the most serious and genuine historical problem which remains: the assimilation of these Viking Rus into the Slavic people among whom they lived. The principal historical question is not whether the Rus were Scandinavians or Slavs, but, rather, how quickly these Scandinavian Rus became absorbed into Slavic life and culture." ^ I. Jansson, ‘Warfare, Trade or Colonisation? Some General Remarks on the Eastern Expansion of the Scandinavians in the Viking Period’, in The Rural Viking in Russia and Sweden, ed. by P. Hansson (Örebro, 1997), pp. 47–51. ^ Jonathan Shepherd, 'Review Article: Back in Old Rus and the USSR: Archaeology, History and Politics', English Historical Review, vol. 131 (no. 549) (2016), 384-405 (pp. 395-96) doi:10.1093/ehr/cew104. ^ Andrii Danylenko, 'The Name "Rus" in Search of a New Dimension', Jahrbücher für Geschichte Osteuropas, new series, 52 (2004), 1-32. ^ Marika Mägi, In Austrvegr: The Role of the Eastern Baltic in Viking Age Communication Across the Baltic Sea, The Northern World, 84 (Leiden: Brill, 2018), pp. 141-216. ^ Jonathan Shepherd, 'Review Article: Back in Old Rus and the USSR: Archaeology, History and Politics', English Historical Review, vol. 131 (no. 549) (2016), 384-405 doi:10.1093/ehr/cew104 (pp. 386-87). ^ Ole Kolsrud, “Kollaborasjon og imperialisme. Quisling-regjeringens 'Austrveg'-drøm 1941–1944”, Norsk historisk tidsskrift, 67 (1988), 241–270. ^ Adolf Hitler, Mein Kampf (HOUGHTON MIFFLIN COMPANY, 1941). ^ Heinrich Himmler, The Posen speech to SS officers (6 October 1943). ^ Bury & Gwatkin 1936, p. 327 "Though the point has been hotly contested by Slavonic patriots, there can be no doubt that these Rhos or Rus are really Swedish Vikings." ^ Janet Martin, 'The First East Slavic State', in A Companion to Russian History, ed. by Abbott Gleason (Oxford: Blackwell, 2009), pp. 34-50 (pp. 37-42). ^ Elena Melnikova, 'The "Varangian Problem": Science in the Grip of Ideology and Politics', in Russia's Identity in International Relations: Images, Perceptions, Misperceptions, ed. by Ray Taras (Abingdon: Routledge, 2013), pp. 42-52 (pp. 43-46. ^ Jonathan Shepherd, 'Review Article: Back in Old Rus and the USSR: Archaeology, History and Politics', English Historical Review, vol. 131 (no. 549) (2016), 384-405 doi:10.1093/ehr/cew104 (p. 387). ^ Waldman, & Mason 2005, p. 668 "In light of evidence, theories - most of them proposed by Soviet scholars with nationalistic agendas - of a Slav state in the Baltic region attacked by and ultimately absorbing Viking invaders are more likely the product of wishful thinking than of fact." ^ Wladyslaw Duczko, Viking Rus: Studies on the Presence of Scandinavians in Eastern Europe (Leiden: Brill, 2004), esp. pp. 3-9. ^ Abbott Gleason, 'Russian Historiography after the Fall', in A Companion to Russian History, ed. by Abbott Gleason (Oxford: Blackwell, 2009), pp. 1-14 (p. 5). ^ Elena Melnikova, 'The "Varangian Problem": Science in the Grip of Ideology and Politics', in Russia's Identity in International Relations: Images, Perceptions, Misperceptions, ed. by Ray Taras (Abingdon: Routledge, 2013), pp. 42-52 (p. 42). ^ Jonathan Shepherd, 'Review Article: Back in Old Rus and the USSR: Archaeology, History and Politics', English Historical Review, vol. 131 (no. 549) (2016), 384-405 doi:10.1093/ehr/cew104 (p. 387), citing Leo S. Klejn, Soviet Archaeology: Trends, Schools, and History, trans. by Rosh Ireland and Kevin Windle (Oxford: Oxford University Press, 2012), p. 119. ^ Christian Raffensperger, 'The Place of Rus’ in Medieval Europe[permanent dead link]', History Compass, 12/11 (2014), 853–65 doi:10.1111/hic3.12201 (esp. pp. 853-54, 858). ^ Dmitry Nikolayevich Verkhoturov, 'Normanism: What's in a Name? ', Valla, 1.5 (2015), 57-65 (esp. 63). ^ Elena Melnikova, 'The "Varangian Problem": Science in the Grip of Ideology and Politics', in Russia's Identity in International Relations: Images, Perceptions, Misperceptions, ed. by Ray Taras (Abingdon: Routledge, 2013), pp. 42-52, citing I. A. Nastenko (ed. ), Sbornik Russkogo istoricheskogo obshchestva: Antinormanism, vol 8. (no. 156) (Moskow: Russkaja Panorama, 2003) and V. V. Fomin, Varjagi i varjazhskaja Rus': Kitogam diskussii po varjazhskomu voprosu (Moscow: Russkaja Panorama, 2005). ^ Artem Istranin and Alexander Drono, 'Competing historical Narratives in Russian Textbooks', in Mutual Images: Textbook Representations of Historical Neighbours in the East of Europe, ed. by János M. Bak and Robert Maier, Eckert. Dossiers, 10 ([Braunschweig]: Georg Eckert Institute for International Textbook Research, 2017), 31-43 (pp. 35-36). ^ Serhii Plokhy, The Origins of the Slavic Nations Premodern Identities in Russia, Ukraine, and Belarus (Cambridge: Cambridge University Press, 2006), pp. 10-48 (esp. pp. 11-12). ^ Jonathan Shepherd, 'Review Article: Back in Old Rus and the USSR: Archaeology, History and Politics', English Historical Review, vol. 131 (no. 549) (2016), 384-405 doi:10.1093/ehr/cew104 (pp. 389-402, quoting p. 397). ^ Thorir Jonsson Hraundal, 'New Perspectives on Eastern Vikings/Rus in Arabic Sources', Viking and Medieval Scandinavia, 10 (2014), 65–69 doi:10.1484/J.VMS.5.1052 (pp. 70-71). ^ Jonathan Shepherd, 'Review Article: Back in Old Rus and the USSR: Archaeology, History and Politics', English Historical Review, vol. 131 (no. 549) (2016), 384-405 doi:10.1093/ehr/cew104 (pp. 389-402). ^ Thorir Jonsson Hraundal, 'New Perspectives on Eastern Vikings/Rus in Arabic Sources', Viking and Medieval Scandinavia, 10 (2014), 65–69 doi:10.1484/J.VMS.5.1052 (p. 71). The Annals of Saint-Bertin, transl. Janet L. Nelson, Ninth-Century Histories 1 (Manchester and New York, 1991). Davies, Norman. Europe: A History. New York: Oxford University Press, 1996. Bury, John Bagnell; Gwatkin, Henry Melvill (1936). The Cambridge Medieval History, Volume 3. University Press. ISBN 0415327563. Christian, David. A History of Russia, Mongolia, and Central Asia. Blackwell, 1999. Danylenko, Andrii. "The name Rus': In search of a new dimension." Jahrbueher fuer Geschichte Osteuropas 52 (2004), 1–32. Davidson, H.R. Ellis, The Viking Road to Byzantium. Allen & Unwin, 1976. Dolukhanov, Pavel M. The Early Slavs: Eastern Europe from the Initial Settlement to the Kievan Rus. New York: Longman, 1996. Duczko, Wladyslaw. Viking Rus: Studies on the Presence of Scandinavians in Eastern Europe (The Northern World; 12). Leiden: Brill Academic Publishers, 2004 (hardcover, ISBN 90-04-13874-9). Goehrke, C. Frühzeit des Ostslaven. Darmstadt: Wissenschaftliche Buchgesellschaft, 1992. Magocsi, Paul R. A History of Ukraine. Toronto: University of Toronto Press, 1996. Stang, Hakon. The Naming of Russia. Oslo: Middelelser, 1996. Logan, F. Donald (2005). The Vikings in History. Taylor & Francis. ISBN 0415327563. The Primary Chronicle's 'Ethnography' Revisited: Slavs and Varangians in the Middle Dnieper Region and the Origin of the Rus' State. Olksiy P Tolochko; in Franks, Northmen and Slavs. Identities and State Formation in Early Medieval Europe. Editors: Ildar H. Garipzanov, Patrick J. Geary, and Przemysław Urbańczyk. Brepols, 2008. Brink, Stefan; Price, Price (2008). The Viking World. Routledge. ISBN 113431826X. Retrieved 2 August 2014. Duczko, Wladyslaw (2004). Viking Rus: Studies on the Presence of Scandinavians in Eastern Europe. Brill. ISBN 9004138749. Retrieved 5 May 2013. Waldman, Carl; Mason, Catherine (2005). Encyclopedia of European Peoples. Infobase Publishing. ISBN 1438129181. James E. Montgomery, 'Ibn Faḍlān and the Rūsiyyah', Journal of Arabic and Islamic Studies, 3 (2000), 1-25. Archive.org. Includes a translation of Ibn Fadlān's discussion of the Rūs/Rūsiyyah. This page was last edited on 21 April 2019, at 21:46 (UTC).